Denne fuldt udstyrede studie er en blok væk fra Le Marais på Saint Sébastien Froissard metrostation, linie 8. det er placeret på bagsiden på det andet niveau (tredje amerikansk) i en moderne bygning med to elevatorer og har en visning på en have. området er meget sikker bolig, det er 28 kvadratmeter eller omkring 280 kvadratfod. Lejligheden er udstyret med fri telefon til 100 lande, herunder Nordamerika og Australien, gratis trådløs internetadgang, gratis kabel-tv. All inclusive ugentlige leje Gebyret dækker kvalitet sengetøj og håndklæder. Placeringen er meget praktisk at turnere Paris. Det er en gåafstand (mindre end fem minutter) til Le Marais, Bastille-pladsen og Republique firkantet. Du kan derefter få adgang til metro hubs let (Republique og Bastille) og gå lige eveywhere i paris direkte uden at ændre linjer. Og du er kun 15 minutters gang til centrum af Paris, Chatelet. Området er trendy og boligområder. Bygningen er beliggende på Rue Amelot, som er en stille gade stadig med caféer og restauranter. Ned i bygningen er der et stort supermarked (Carrefour Market). Vær opmærksom på at for at bekræfte en reservation spørger vi om 20 procent af betalingen og foreslår altid paypal og kreditkortbetaling. Rengøringsgebyret og det refunderbare depositum faktureres automatisk på linjen. Betalingsprocessen gebyrer, sen og tidlig check-in gebyrer og by skatter er ikke, de kan faktureres manuelt efter booking eller betalt kontant ved indtjekning. The unit is as pictured. Although small it is perfect for 2 well organized people. The lift is wonderful given that so many Paris apartments are walk-ups. The Metro a couple minutes walk and a grocery store downstairs in the building is a major plus. Olivier was a pleasure to deal with for the booking and his assistant Salvador who met us was great. Cleaning deposit was credited in just a few days, no worries. Thank you again for a wonderful unit! Studio confortable, avec vue sur un jardin. Nous n'hésiterons pas à le conseiller. Quiet and comfortable little apartment facing an interior courtyard with plenty of restaurants close by. Lots of fresh, clean linens, plenty of towels AND a washing machine. Very conveniently located between two metro lines. 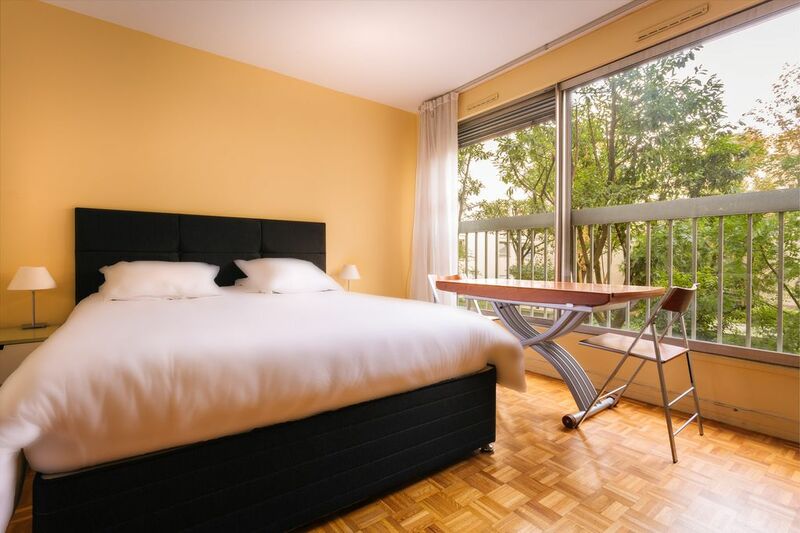 The apartment sits on the edge of the Marais offering great food shopping (rue Bretagne) and excellent markets. Olivier, the owner, is a lovely man doing whatever he can to make your stay enjoyable. Thanks so much, Olivier. please note that we usually do not take less than 4 nights reservations unless they fit nicely to the calendar. otherwise 2 or 3 nights reservations are acceptable at the last minute ( in the last 2 weeks ahead of arrival ). svp prenez compte que generalement nous ne prenons que des reservations de quatre nuits minimum a moins que celle ci ne sadapte au calendrier ou en derniere minute. Please be aware that on top the listed rental prices you need to pay -	The cleaning fee -	The refundable deposit which is refunded after final cleaning is done -	The possible payment process fees ( around 3 per cent for payment on line) -	the possible 40 euro late check in fee if you check in after 900pm, the possible 40 euro early check in fee if you check in before 12pm -	The city tax representing 0.83 euro per day and per person The cleaning fee and the refundable deposit are automatically billed on line . the payment process fees, the late and early check in fees and the city taxes are not , they can be billed manually after the booking or paid in cash at check in. Veuillez noter qu’en plus du loyer par journee ou par semaine vous devez payer -	Les frais de menage -	La caution remboursable -	Les possibles frais de transactions ( environ 3 pour cent pour les paiements par carte en ligne, un pourcentage comparable mais variable pour les paiements par paypal) -	Les frais d’arrivee tardive de 40 euro si la remise des cles se fait apres 21h00 , les frais d’arrivee matinale de 40 euro si la remise des cles se fait avant midi -	La taxe de sejour representant 0.83 euro par jour et par personne Les frais de menage et la caution sont automatiquement factures en ligne . le reste ne l’est pas mais peut aussi etre facture manuellement ou bien paye en especes au moment de la remise des cles.